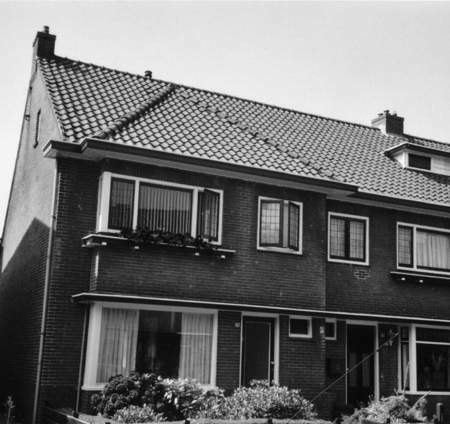 Benjamin Stern (born on the11th of June 1877), lived at 75 Ambonstraat. In one of the numerous inventories of Meppel Jews dated 1941 his occupation was mentioned: ‘Reiziger’ (‘traveller’) and dancing teacher as well. He married three times. First he married Naatje Buitenkant, (born in Den Helder) who died in 1921, then Rebecca Chottel (born in Amsterdam). What had happened here? Earlier that evening, Benjamin Stern had returned home from Amsterdam and had found his wife lying in her bed in the back room in a pool of blood. She had a terrible head wound and everything was covered in blood. He immediately alarmed the neighbours and together they returned to the house where they found under her pillow, drenched in blood, the blood-stained wooden handle of an iron hammer with hairs on it. It was obvious that it was murder, so the police and the doctor were called. They detected a perilous wound on the head of the unconscious Mrs Stern. Immediately she was taken to Sophia Hospital in Zwolle. The hospital in Meppel could not adequately handle such a wound. Mrs Stern-Chottel died 24 hours later. ‘[…] In the meantime the police had started their first investigation, including an interrogation of the domestic help Eike V., who declared that, that morning she had finished her work and had left at around ten thirty and that there was nothing unusual then. This statement supported the thought that maybe this was a suicide, although it would be very difficult to get such a head wound by hitting oneself with a hammer. Mrs Stern was a mental patient, and would behave strangely sometimes, so this seemed not impossible. A telephone call from Zwolle put an end to the suicide theory. It was stated that the woman’s skull had been hit at least ten times with a hard object. Also in 1936, people were interested in the motive for the murder. Eike had been working for the family Stern for about four months before the fatal day. From day one, the neurotic Mrs Stern made life hell for her with her constant nagging. That was not new: this also affected the life of Benjamin Stern. Every domestic help had for the same reason never stayed longer than two weeks. The fact that Eike had stayed for four months, was partly due to the economic crisis, which at that time had reached its highest point. Unemployment was high and if Eike had handed in her notice to leave, she would not have found a new job. In those four months, Eike V. started to hate her employer more and more and on the 3rd of May 1936 she blew a fuse due to the constant harassment. As everyone knew what it was like in the Stern house, the sympathy for the girl and her respected family was greater than that for the victim. Eike may have had good reasons to do what she did to Mrs Stern, of course she was guilty. Even though the psychiatric examination proved that on the moment of the deed she was in a state of diminished responsibility, she still got six years imprisonment and was committed. Later, Stern married Sara Polak (born at Appingedam, on the 12th of February 1896). From both marriages there were no children. Mr. Feddema, who lived in Ambonstraat before the war, still remembers that he had to light the gas of the burner on the Sabbath, so that they could cook. He never had to turn it off. In the thirties, Benjamin Stern would advertise in the Meppeler Courant with his photograph and the caption ‘The man of day and night’. 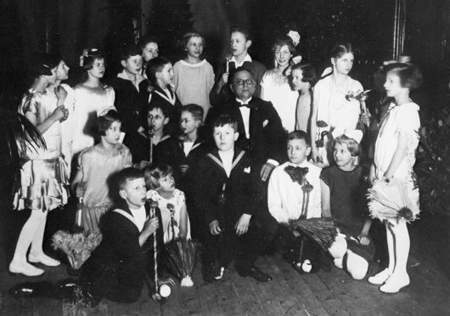 He gave quite a few dancing lessons in the area, often accompanied by Johan Lingeman on the piano or Max Vilé. Dancing class given by Benjamin Stern. On one of those days Benjamin was going to be ‘honoured’. One of the committee members of the club spoke a few words of appreciation and then he was presented with a medal as a token of appreciation. Benjamin was delighted. Little did he know that it was an old medal of the goat breeders association … Next to teaching dancing, Benjamin also sold crockery (reason for which he had ‘Reiziger’, (traveller) added to his name). He also sold his goods on the market. He had a shop for a while on the 2nd Hoofdstraat and before that on Prinsengracht. ‘Dikke’ (‘Fat one’ was his nick name to distinguish him from his brother Izak). Stern was not liked in Meppel, because he was not an amiable man. There is very little information about what happened to Benjamin and Sara in the early years of the war. For them the same procedure as for the other Meppel Jews: business activities had to be ended, possessions had to be handed in, and movements were restricted. Samson Frank, a textile trader, (son of greengrocer Frank) and his wife Sara Heny Lehrer moved in with Benjamin and his wife Sara. They were married on the 1st of July 1942. This marriage would only last six weeks. Samson had to report to the labour camp in Linde, and not much later he was transported from Westerbork to Auschwitz, where he died on the 30th of September 1942. After the departure of Samson, Sara went to live with relatives in Den Haag (The Hague); she died on the same day and at the same place as Samson. On the 31st of July 1942, Benjamin was taken to the labour camp in Vledder together with four other Meppel Jews. From there he was deported to Westerbork on the 3rd of October. There he was reunited with his wife Sara. Not for long, though. Benjamin and Sara were transported to Auschwitz on the 5th of October and died there on the 8th of October. 75 Ambonstraat, on the right.